Prosciutto, quite simply, is the original meat candy. It is salted and dry-cured (up to 18 months) pork made from the hind leg or thigh; the same cut used for ham. Prosciutto is found in many Italian and Spanish foods and, unsurprisingly, the word itself is of Italian origin. Prosciutto pairs well with everything from eggs, to sandwiches, to pasta, and a variety of other vegetables, cheeses, and proteins…..so pretty much EVERYTHING. It adds a chewy and salty element to any pairing, in some ways similar to bacon but without the crunch or grease. Unlike bacon, it doesn’t have to be “cooked.” Just like any deli meat, it can be eaten without being heated because it has been cured over a long period of time. But it is VERY salty. For this reason, I recommend you order it sliced very thin. So thin, it’s basically translucent. Try a slice and I think you’ll agree: prosciutto is the meat of the gods. When I’m not consuming it as a meat snack (yes, meat snacks are a thing), I include it with a meal. Why? Because it’s delicious. I thought we already went through this? To TURN UP an otherwise boring chicken breast, we stuffed it with prosciutto…and spinach….and Fontina cheese. Hungry Yet? This recipe takes a bit of prep work, but it’s well worth it. You can substitute fontina with another creamy cheese (ie, provel, mozzarella, etc); you may also switch the prosciutto for ham. The outcome will always be similar – a tasty dish that you, your family, and your guests will enjoy. Also, because it takes nearly the same amount of time to prepare 4 chickens as 10, it’s a great dish when cooking for a crowd, especially when cut into smaller pieces (ie, each breast cut into 3 pieces). Please view the pictures which shows how to stuff the chicken breasts. You can also serve this with red, white, or a lemon butter sauce. Cut the chicken breasts along the side to create a create a “pocket.” You can butterfly the chicken as shown by extending the pocket cut end-to-end. Lay Fontina Cheese in center of chicken, as shown. Fold chicken together and tie it with butcher twine or use toothpicks (shown) to secure. Heat oven to 375 and bake for 35 – 40 minutes or until internal temperature of chicken is 165 degrees Farenheit. We have included an easy-to-print recipe and additional pictures, below. We would love your feedback in the comments….let us know what you think! 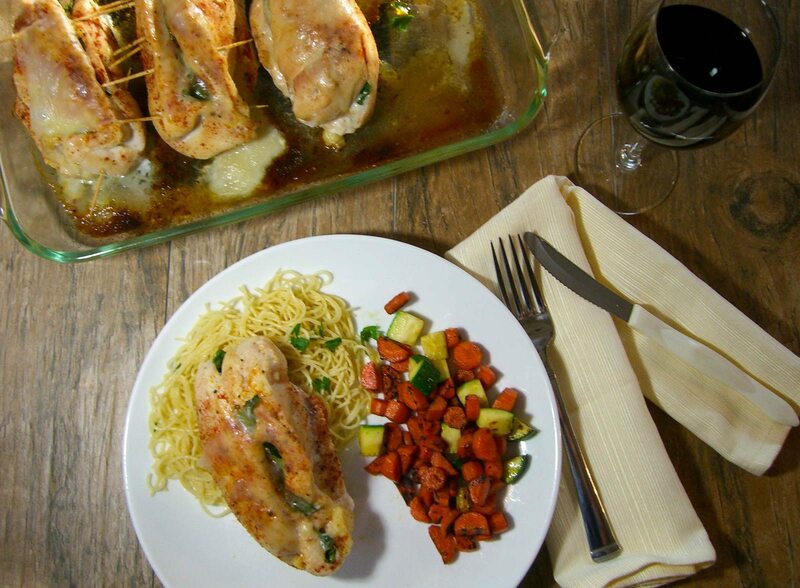 Simple and delicious recipe using only chicken, prosciutto, cheese and spinach.